Galfer +3" Front Braided Stainless Brake Lines - +3" upper line for extended handlebar risers. 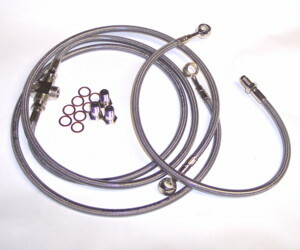 3 - line Galfer braided stainless steel front brake line set. These lines will improve brake feel and they look great. Clear plastic coated to prevent scratching of bodywork. Comes complete with lines, tee fitting and banjo bolts/washers.